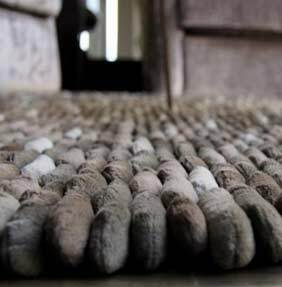 Cobble Rugs by Dreamweavers are very similar to their best selling Pebble range, the only different being the pebbles are replaced with a cobble like structure. The Cobble is slightly bigger and a bit more uniformed than the Pebble collection. Cobble is still made from the same deep and super soft chamois like polyester fabric. A rug designed to add luxury, comfort and super designer looks all in one. Choose from a large selection of sizes and colourways. Oh and not forgetting the matching cushions, which look fantastic whilst oozing with quality. Cobble rugs are designed for Light Traffic areas, each rug features a non slip backing.